Play-Doh started out as a wallpaper cleaner in the 1930s. It first hit it big with 1950s kids. 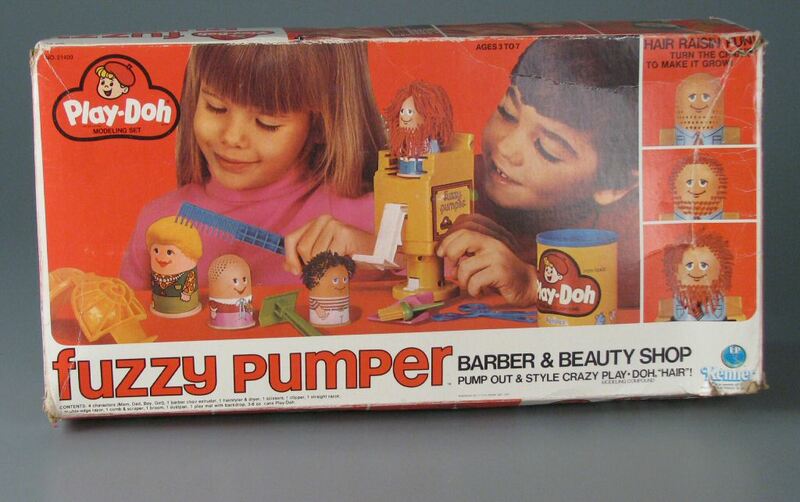 But we 1970s and 1980s kids scored, too -- we were of the generation of the Fuzzy Pumper Barber Shop. This fun list puts it as the #5 top Play-Doh set of all time. It was awesome. You pumped Play-Doh through the holes in the little guys' plastic heads, and then chopped and styled (in only the vaguest sense of the word) it to your liking. I don't remember this version, the Mop Top Barber Shop, but it looks like a more hippie-ified version. It looks like the latest edition is the Fuzzy Pumper Crazy Cuts Playset. That's one goofy looking, removable-head guy. I miss the original. And in 1992, there was a Muppet Fuzzy Pumper set, which is BRILLIANT, because all of the Muppets had hair that looked like it had been extruded through the Play-Doh Fun Factory, and all of them needed a trim. How about you? Did you play with this, or other Play-Doh sets? Current sets include a Magic Swirl Ice-Cream Shoppe, a Burger Builder, and a Spaghetti Factory. And for retro freaks like us, they still have that creepy Dr. Drill and Fill dental set, and an awesome Star Wars set. Oh, I had the barber shop! It was awesome. And I think either a friend or a cousin had the dentist one. I loved drilling teeth and cutting hair!